Growing up in Bangkok, river trips were reserved for special occasions. New Year’s Eve? Let’s head to the river. Visitors in town? They’d love a river cruise. Dad taking business colleagues out for an authentic Thai dinner? Please don’t make us go to the river again.This was the early 2000s and the Chao Phraya River was an interesting mix of historical and cultural monuments, decrepit waterfront houses and five-star hotels. Not only did it feel worlds away from the exciting, chaotic Bangkok city centre, the slog to get there often was enough to put you off returning anytime soon. Fast forward to 2018 when I was given the opportunity to stay at The Siam Bangkok, a relatively new, luxurious hotel situated on the very river I had been avoiding for years. In honesty, I was excited to visit the property, partly to find out why on earth anyone would want to stay on that side of town. Yes, I was being pessimistic, actively dismissing the friends that had been telling me that it was a whole new world (river) and that I might realise that I had been missing out. Arriving at the The Siam, I was surprised that the journey had been pleasant, more of a scenic tour than the trek that I had anticipated; the lobby making me feel like I had travelled 60 years into the past rather than 30 minutes in a taxi. 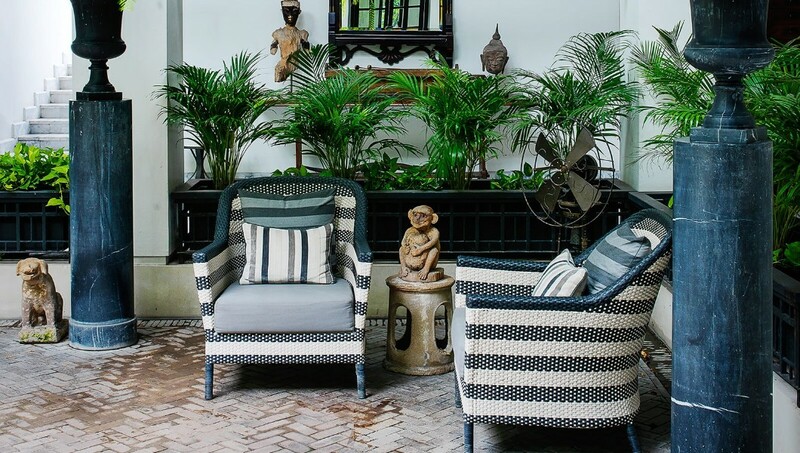 What welcomed me was a new building reflective of a different era – designed with elements of Thai design and Art Deco style, scattered with antiques that complement the surroundings without making it feel like I’d walked into a museum. 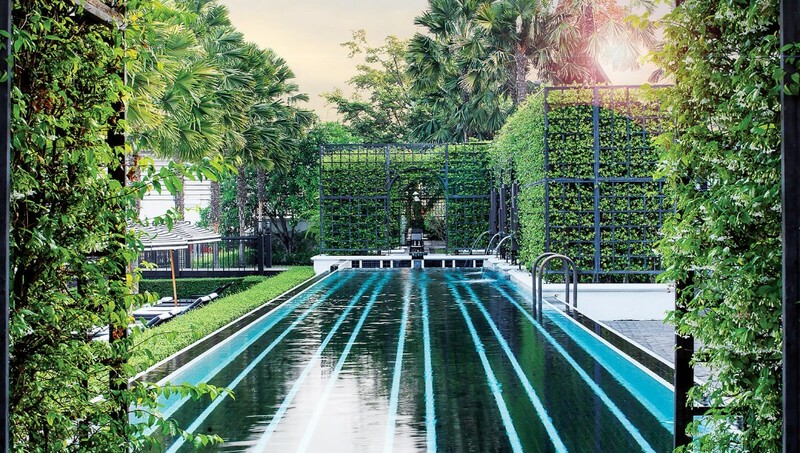 The greenery is what makes The Siam feel luxurious even before your stay has officially begun, an oasis that is such a contrast to buildings that surround it. Guided to the Siam Suite by our butler, it became apparent that the beauty and ethos of the hotel was appreciated by the staff as much as the guests, and he was excited to introduce us to what would be our room for the night. Situated to the side of the impressive atrium that basked in the sunlight, we entered the dimly lit suite that was instantly both calm and inviting. The 80sqm space was set out in a way that made it practical; a small living area at the entry, followed by a large bedroom that was only made to feel bigger thanks to its high ceilings. Finally, the bathroom with an impressive bath positioned front and centre, with vanities at either end stocked with locally made toiletries that looked like they had come straight from a lavish spa. The suite is made for relaxation, and in that sense, it more than served its purpose. A slice of heaven to unwind in after a long day of exploring, which felt like a more luxurious version of your home. 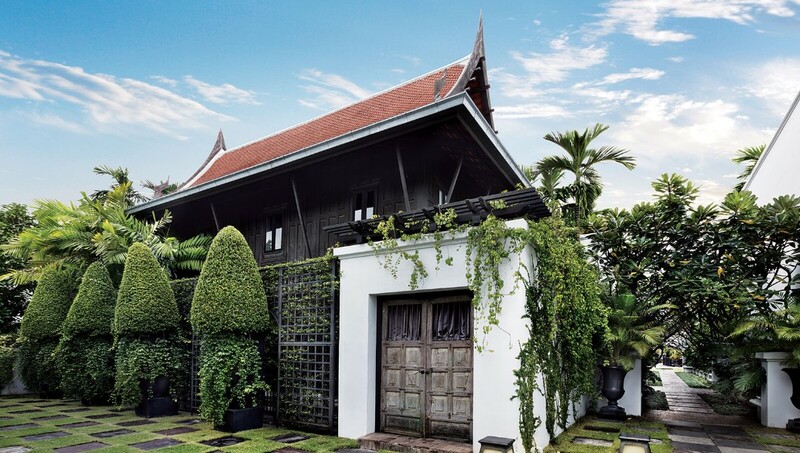 Exploring the rest of The Siam, I found that there were rooms designed for every holiday-goer – private villas with pools, suites that look directly over the river, and even a cottage. All of these shared the same DNA; comfortable, stylish and welcoming. 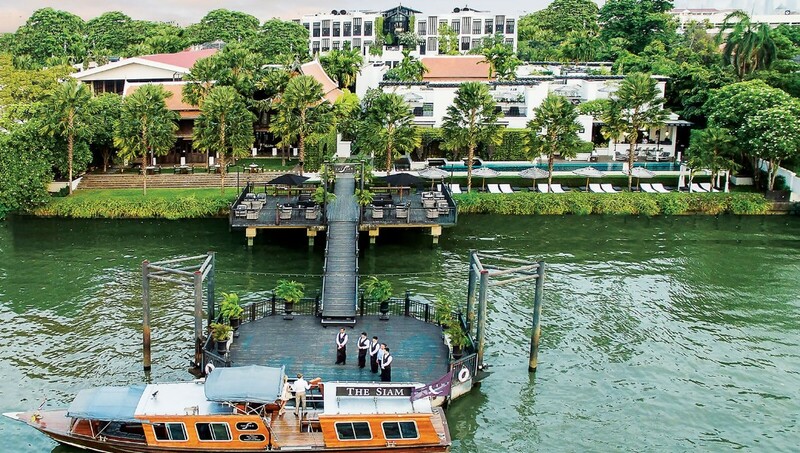 The property’s pool runs parallel to the Chao Phraya, giving guests the opportunity to view the busy waterway, but with a clever design that ensures that the waterway isn’t watching them. Also overlooking the river are the brand’s signature restaurants that are also the location for breakfast. Dinner at the Deco Bar & Bistro was one of my most enjoyable dining experiences in a long time, and the beautiful setting didn’t hurt either. During my stay I learnt that there had in fact been a lot of changes to the neighbourhood. New restaurants, night markets and Pak Khlong Talad, the flower market that is truly worth a visit. Other notable must-sees include Thai restaurant The Summer House at the Jam Factory and the Asiatique the Riverfront night market. And it goes without saying that if you haven’t visited the Grand Palace, you really can’t miss it. The Siam has a dedicated boat that will deliver you to any location on the river you choose, as well as to the nearest BTS (Skytrain) station so that you can enjoy an incredibly quick trip into the heart of town. Evidently, the riverside delivers both relaxation and excitement and allows guests to decide which one they want to experience. I suspect that it is properties such as The Siam that have helped to breathe new life into the waterfront landscape by seeing the possibilities where some people (mostly me) saw fault. Long story short, I need to make some calls to apologise to my friends for not taking their advice and instruct them to book the biggest suite – because I’ll be tagging along.